Dash camera is a very important device to have for every vehicle. It is used by thousands of motorists in Australia to record everything you see on the road whether your vehicle is in motion or parked. A dash cam is designed to record continuously through your vehicle's windscreen or clips on to your rear-view mirror. Some models come with rear camera providing you better coverage that can be used as vital evidence in the event of an accident. Some dash cameras offer a parking mode feature which records when your car is parked. This feature is for additional protection in case theft or someone smashes into your vehicle and drives away. This also serves as your prof a hit-and-run incidence. No matter what vehicle you drive whether you have a Car, Caravan, Truck, Trailer, Camper, or Motorhome Elinz wants to make sure you have a reliable witness to everything that happens to you and your vehicle on the road. Elinz specializes in your safety, with our high-quality dash cams ensuring you always have peace of mind, and peace of mind is indeed, priceless. We continue to take the lead in terms of features and innovation. The car camera we offer usually comes with a built-in LCD screen for viewing depending on your preference. It also comes with different high-quality chipsets, video quality, viewing angle, recording modes, as well as WiFi and built-in GPS system that show the vehicle speed and location. Depending on the vehicle you drive, the features you need, and the budget you have we will help you choose the best dash cam to suit your preferences. Single lens cameras record footages through the windscreen of your car. They are often the most affordable options, not to mention very easy-to-install. The dual camera dash cam on the other hand, allows you to record footage of what’s in front and behind of your vehicle, so you’ll always be covered if you need to file a claim and expedite insurance payout. 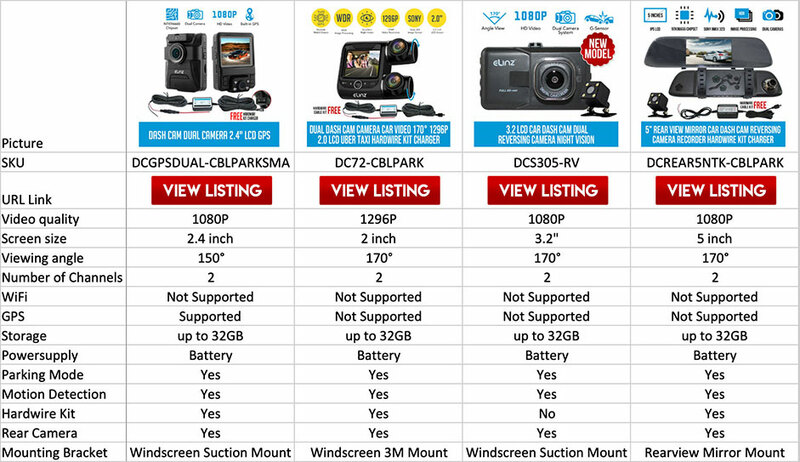 Dash cams are available in a variety of lens types depending on your preference and budget. A dash camera’s viewing angle is a very important factor to consider just like the video quality. Do not settle for the 120-degree quality like the any other dash camera Australia has. We offer a wider range of dash cameras providing you with exceptional 150-degree to 170-degree viewing angle that can capture great moments while you are on a trip, and footages for emergency situations. It is very important to have a wider viewing angle any dashboard camera so you can record footages in wider view and capture number plates even they have switched lanes. Both battery and capacitor, dash cameras get their power supply from your vehicle and designed to save files in case of power failure or emergency situations. Battery dash cameras can also be used even if your vehicle is off. If your dash cam has a parking mode feature, keep eyeing on your vehicle as your dash camera is always ready to capture footages and motion detection. Nowadays many types of incidents can happen while we are away from our vehicle. Occurrences can be from a simple door ding at a parking lot, to a hit-and-run accident by a careless driver, or, a theft inside the car when it’s unattended. It also comes reliable in the event of power loss during an accident as it can provide backup power within the vehicle. Capacitor dash cameras are more heat resistant as they are designed for extreme temperature and therefore always ready to record when your vehicle is on. Our Dash cam night vision is enhanced with features such as Wide Dynamic Range for one, to improve the quality of the images at night. This is proven beneficial for capturing number plates and signs for evidence in the event of an incident. Parking mode is a dedicated recording mode that is designed to protect your vehicle even when the car is off. It is a very important feature you need to look for when reading dash camera reviews before buying. The said feature lets the cam catch events like hit and runs or vandalism. By turning on motion detection feature, the dash cam will start recording only every time it detects motion or moving object in front of the camera. Then it goes on idle mode again to save battery. This function is highly is recommended and useful in parking mode when you need to record any activity like stealing or scratching your car. Global positioning system is a great feature to have in any dash cam Australia has, as it lets you have your exact position and speed embedded into your recordings. The built-in GPS receiver can log the date and time into the recorded footage, locating where you are. These details are useful evidence for emergency situations, filing police reports and insurance claim. A dash camera with WiFi can connect directly to your smartphone through an app. We have a high-quality dash camera with WiFi feature so you can use a smartphone as a screen to review your dashcam footage. With this function, in the event of an accident, you could quickly show the footage to the law enforcement which can help describe what happened without the need of a laptop or removing the micro SD card. Loop recording is an important feature you need to look for in a dash camera. If you are using a relatively small capacity memory card on your dash camera, you don’t need to worry on limited storage as it seamlessly records over old footages from the beginning. Saving the newest footage which may contain an accident or incident will be safely stored in your memory card. Most of our dash cameras come with hardwire kit so you can keep the power cables out of sight, making for a cleaner install. It will also free up a cigarette socket in your vehicle which can be left for use with a phone charger, GPS, or other automotive accessories. Highly- recommended is the dash camera with parking mode and motion detection, so you can continue recording while the vehicles is off.